Description: 268 rolls over the high bridge at Harpursville on a typically snowy day in the Tier. Description: NS 62G slab train bound for Weirton heads east through Salineville. Description: NS 62G heads east in very early morning light, note the PRR CPL in the background. Description: The location of this picture is actually on what NS calls it the Turkey Path. Here is where ballast trains are being loaded. 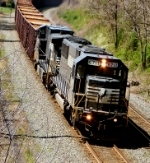 Description: An eastbound coal train battles the grade with four units up front and two pushing from the rear. Title: NS 8554 and crew just in from Hagerstown, MD. Description: NS 9876(C40-9W) leads this trio with 9064(C40-9W) picking up the rear. Description: An ex-Conrail SD60 leads the 213 west at 1:15PM. Description: NS intermodal 213 zips westbound at CP Laurel behind ex Conrail SD60. Description: Two blue units lead an NS unit on H67 as they sit at WK.